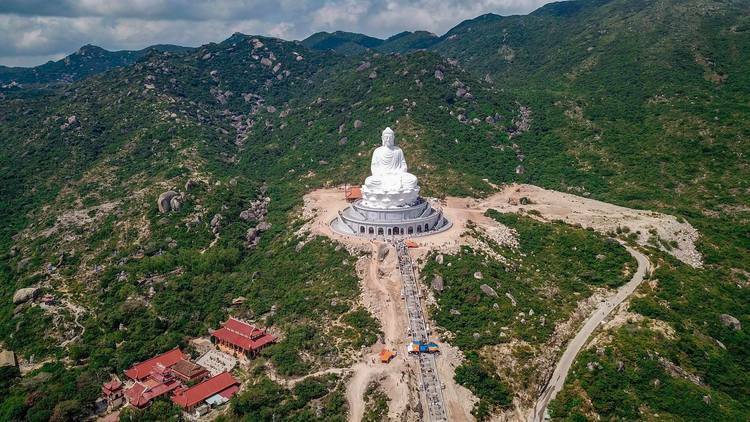 If you have a chance to visit Quy Nhon (Quy Nhơn), you should not miss the Linh Phong Pagoda – a sacred tourist destination that has allured a large number of tourists and visitors each year. This pagoda is situated in Phuong Thi (Phương Thi) village, Cat Tien (Cát Tiên) commune, Phu Cat (Phú Cát) district, Binh Dinh (Bình Định) province. The surroundings of this ancient temple have the beauty of wildness. When coming to Quy Nhon, tourists often visit not only Linh Phong Pagoda but also other must-see beautiful destinations of Quy Nhon that is well-known for the beautiful beaches, long white sandy coastline, impressive mountains, forests and many stunning landscapes. Therefore, the best time to visit Quy Nhon as well as Linh Phong Pagoda is from April to September. During this time, you can see the amazing landscapes and sightseeing surrounding this ancient temple. You can admire the high mountain stream that flows down, and to the pagoda, it is divided into two branches. But, you can visit this sacred and spiritual temple after Vietnamese Lunar New Year – the most important and biggest festival in Vietnam when you can pray for good things to happen in the New Year. Linh Phong Pagoda or Ong Nui (Ông Núi) Pagoda that is more than 300 years old and well-known as a natural historical and spiritual relic site. This pagoda was built to worship Buddhist monk Tinh Giac – Thien Tri (Tịnh Giác – Thiên Trì) who healed and saved local people from epidemics and diseases. That is a reason why local people called him “Ong Nui” (Mr. Mountain). Linh Phong Pagoda also has another legend that is associated with King Minh Mang in the seventh year of the reign. The king who suffered from a serious disease but no one of the royal physicians could treat slept and dreamed that a Buddhist monk gave him medicine. The king woke up in the next morning and felt stronger as his disease disappeared magically. Asking courtiers about that strange miracle dream, he was told about the legend of Mr. Mountain. King Ming Mang gave Linh Phong Pagoda valuable gifts and a new monk’s robe. This pagoda nestles in the deep forest with a lot of rocks that has different shapes around. In front of the pagoda is the Lotus Lake and water in the lake was believed to never run out of. Nothing is greater than standing on Linh Phong Pagoda and seeing the impressive rice fields and stunning blue sea in the East. Looking to the Southeast, you can admire the Thi Nai Bridge and lush green forest that stretch from Cach Thu to Go Boi. Furthermore, tourists can also see the panoramic view of Quy Nhon that looks like a beautiful picture in front of your eyes with peaceful beaches, white sandy and waves crashing to the shore. All of these create the romantic scenery with breathtaking beauty. Furthermore, tourists can visit the statue of Mr. Mountain near the edge of the stream and discover the big cave inside. Being of the most popular pagoda in Binh Dinh, Linh Phong Pagoda has attracted a larger number of visitors inside and outside the province, domestic and international tourists to visit especially during festivals hosted in Linh Phong Pagoda on the 24th and 25th days of the lunar month. The walking road from the foot of the mountain to the pagoda is hard and rough, but the cool water of the high mountain stream and the Lotus Lake will help tourists to get their energy and power back. These days, there it’s the new road for visitors easily to reach the pagoda by car but for the young who likes adventure still choose to walk by the old path to visit Linh Phong Pagoda. 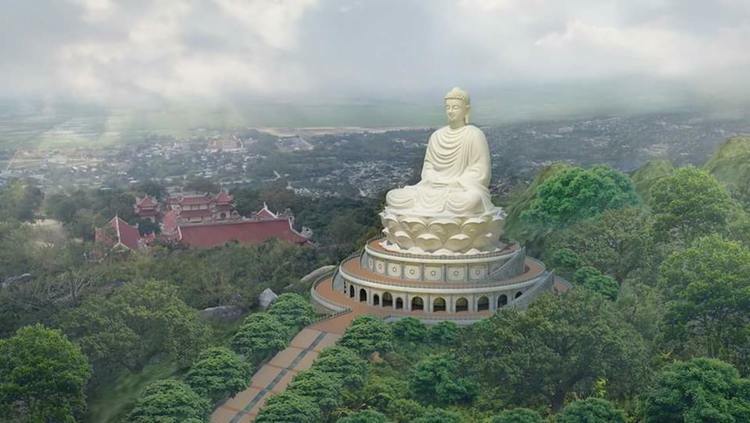 A 500 billion VND project is carried out to build an ecological, historical and spiritual tourism complex in Linh Phong Pagoda. After the project is finished, this area will have Thach Lam Park, a Buddha statue and a resort that brings the values to Linh Phong Pagoda. Maybe we have to wait for the resort under the project to finish the construction and open to welcome guests but now there are no options for meals and accommodations near the pagoda. Therefore, you have to travel to the city center where there are many restaurants and hotels. Here are several accommodations for you to consider staying overnight: Ha Min (Hà Min) Hotel (250,000VND/night) Yen Vi (Yến Vi) Hotel (250,000VND/ night), Anh Thu (Anh Thư) (220,000VND/ night). 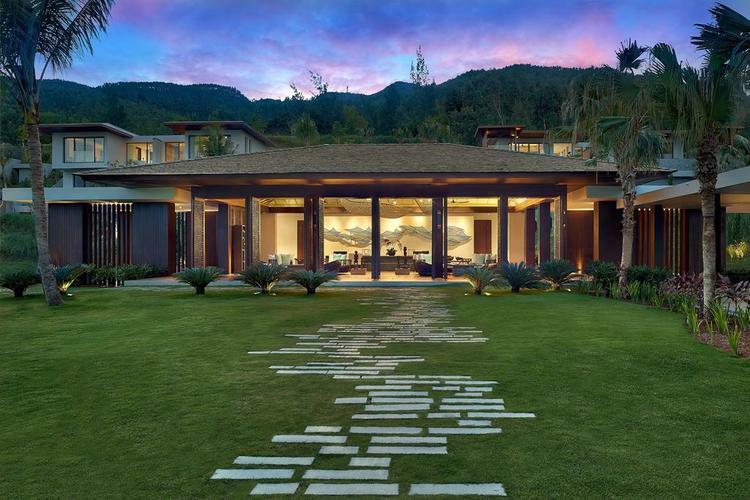 In the luxury hotel and resort chain, there are Muong Thanh Quy Nhon Hotel, Anantara Quy Nhon Villas, FLC Luxury Hotel Quy Nhon, etc with the price ranging from 900,000 VND to 5 million VND for one night. And it is an omission if you visit Quy Nhon without tasting the specialty foods like bun cha ca (bún chả cá), bun tom (bún tôm), banh trang nuoc dua (bánh tráng nước dừa), banh xeo tom nhay (bánh xèo tôm nhảy). With the values, architecture and unique beauty, Linh Phong Pagoda that has attracted tourism projects nowadays is promising to be a famous tourist destination in Binh Dinh. After finishing the article, I hope you will find the useful information and wish you have a memorable trip to Linh Phong Pagoda. To know more about Vietnam travel, visit our Vina homepage.